As far as I can tell, there are four arguments against the federal government providing any kind of welfare to its citizens. Well, actually three arguments and one reason. Let's dispense with the reason - resentment. People just seem to resent anyone else getting anything that they don't get or wouldn't want. Thus, when someone receives a government check, someone else is going to resent it - reasons, needs, economic benefit notwithstanding. Many people even resent Social Security. So let's just dispense with resentment. It's nothing but an emotion. The three arguments against government-provided social welfare are cost, addiction, and vote buying. People opposed to government welfare are convinced that the government cannot afford it. People opposed to government welfare are also convinced that welfare robs people of the initiative to work, makes them lazy and dependent, and addicts them to government support. People opposed to government welfare are convinced that politicians bribe voters with promises of free stuff. I have a few thoughts on each of these arguments. First - costs. Welfare paid for by the states does typically cost state taxpayers money. That's because the states must collect revenue in order to spend and revenue collected by most states takes the form of state income, property, and sales taxes. Except for federally provided money, states spend money collected from their residents. So yes, state-run welfare costs the taxpayers money. But this is not so at the federal level. Federal spending is not dependent on, or even related to, federal taxation. Because the federal government creates dollars by spending, welfare funded by federal spending does not cost taxpayers a dime. In fact, federal welfare adds dollars to the economy providing a degree of stimulus which promotes increased private sector spending which promotes greater private sector production which promotes private sector job creation which lessens the need for many welfare payments. So rather than argue that welfare costs the government money, I would argue conversely that federal welfare adds to the country's economic growth. I would further think that all government welfare should be paid for by the federal government, not the states, even if the states were to continue to administer the programs. Second - addiction. Face it, there will always be some relatively few cases in which welfare recipients grow dependent on the government dole for an extended period of time or even a lifetime. In fact, Social Security is a form of federal welfare that lasts a lifetime and sometimes longer and I am certain that few, if any, Social Security recipients have ever chosen to quit receiving their payments because they already make enough money to get by. Make no mistake, Social Security is every bit as much welfare as food stamps and section 8 housing. We think we paid for Social Security with our payroll taxes, but as we've already discussed, federal payroll taxes are just federal taxes and as such, they just remove dollars from circulation and destroy them. Federal spending is not funded by federal taxes - remember? But I digress. If federal welfare promotes laziness and dependency, then do not all sources of welfare promote laziness and dependency? Welfare is welfare is it not? You can grow as dependent on the largesse of your parents or siblings as you can the federal government. Is it any less moral for the federal government to provide someone money for food than for the Red Cross, Salvation Army, or local soup kitchen or homeless shelter to provide food or money for food. Does it really make sense that welfare provided by the federal government causes more welfare dependency than welfare provided by private means? If I am hungry and broke what difference does it make to me where the welfare comes from? If I am prone to dependency, I can grow just as dependent on the Salvation Army as I can the federal government. To argue that federal welfare breeds dependency is to argue that all welfare breeds dependency. Finally - vote buying. People vote in their own best interests whether those interests are promises of tax breaks, new roads, federal spending on pet projects, or the promise of welfare. Pick your poison. 'Nuff said. You may choose to oppose federal welfare, that's your right. But just don't be so quick to convince yourself that because the welfare is provided by the federal government that it is inherently bad. I must say, the soft cover version of my book, Richard Gatlin and the Confederate Defense of Eastern North Carolina (The History Press, 2015), is a good-looking, good feeling book, but for those of you who do all or most of your reading on eBooks now, it is available in Kindle version from amazon.com for just $9.99 plus tax. I am a Barnes and Noble Nook reader myself, but the Nook version is not available yet so I downloaded the free Kindle app for my Nook Android tablet and bought a Kindle copy of the book. For any of you who would like an author-signed softcover version of the book, I have a limited number of copies that I can sell at $20.00 each, including tax and shipping (domestic only). Just send me an email at jimg320@gmail.com and we'll get together on how to pay and where to send the book. Sorry I don't take credit card payments. Because most sales will be through amazon.com or barnesandnoble.com, or through book stores and historic sites, I just won't have enough personal copies to make credit card sales feasible. I encourage everyone to get a copy, though, regardless of format or source. You and I will both be glad you did! As one of my favorite readers said in his excellent review, "This is a great read for Civil War buffs and for those wanting to see real life in the nineteenth century!" It is income tax time again so I want to follow up my previous post with this question - where do our federal tax dollars go? Silly question you say. I suspect most of us assume that our federal taxes go into the Treasury's own bank account and that the Treasury uses that money to pay federal bills, expenses, benefits, and giveaways. That is what it looks like on the surface, but looks can be deceiving. Recall from my previous post that US dollars are simply federal government IOUs, redeemable in nothing but other dollars. When the federal government collects your tax dollars from you, it retrieves from you some of its own IOUs that have found their way into your pockets. So, let us do a little analogy. You sell me your old pickup truck for $500, but instead of giving you cash or a check, I hand you my signed personal IOU for $500. You expect to redeem that IOU later, at which time I would hand you $500 US dollars and you would hand me back my IOU. My IOU is worth $500 to you when you have it. What is my IOU worth to you when I have it? If you said ZERO then you can see where I'm going with this. So how about we change this up a little and instead of my giving you $500 US dollars and taking my IOU back, I hold a gun to your head and simply take my IOU back? Now in my possession, how much is my IOU worth? Zero because you no longer have it, and because I cannot owe myself. My point is this: an IOU in the hands of the issuer has no value. Thus, a dollar in the hands of the federal government has no value. It is gone, destroyed, out of existence. When the federal government takes your tax dollar, that dollar is gone for good. When the federal government spends, it issues new IOUs (aka: dollars) and it can issue those IOUs (aka: dollars) in unlimited quantities, subject of course to Congressional authorization. Federal taxes are unneeded to pay for federal spending. Income taxes pay for nothing. Payroll taxes pay for nothing. Inheritance taxes pay for nothing. Gasoline taxes pay for nothing. Federal tax dollars pay for nothing. They cannot because they are zapped, destroyed, out of existence as soon as they come into federal possession. So then, why does the federal government levy taxes? It has its reasons, but those are for a later post. Richard C. Gatlin (1809-1896), former US Army officer and Confederate general from Kinston, NC was a man of the 19th century, an age when personal tragedy was commonplace and childhood death visited many families. During his long and fulfilling life, Gatlin endured his share of low points and heartbreak as outlined below. o After graduating from West Point in 1832, Richard C. Gatlin reported to Fort Gibson, Indian Territory as a brevet 2nd lieutenant. In his first month on active duty, a percussion cap from his gun exploded into his left eye leaving a metal shard that surgery could not dislodge. He went on medical leave in New Orleans then back in Kinston until October 1833 when, after the "inflammation subsided", he returned to Fort Gibson. He appears to have never regained the sight in his left eye. o On December 28, 1835, Gatlin's older brother, Assistant Surgeon John S. Gatlin was one of the last of 106 men killed in the infamous Dade Massacre in Florida. Seminoles ambushed a column of 108 men under Major Francis Dade near present-day Bushnell, Florida. Only two soldiers survived and one of them died just days after the attack. John S. Gatlin fell in a hail of bullets after firing all four shots from his two double-barreled shotguns. Six months later, Gatlin's father died, reportedly despondent over the death of his older son. o On September 23, 1846, while leading his 7th Infantry Company F in house-to-house, hand-to-hand combat in the streets on Monterrey during the Mexican War, Gatlin took a bullet through the shoulder. The wound knocked him out of action for several months. Gatlin did however earn a promotion to brevet major and a commendation for "meritorious service". o In July 1849, Gatlin married for the first time, at age 40, to 22 year-old Scioto Sandford. Their first child, Johnny, was born in July 1850. On December 27, 1851, while Gatlin commanded the post at Fort Smith, Arkansas, Scioto gave birth to the couple's second son, Alfred, but a week later on January 3, 1852 Scioto died followed by the newborn baby on January 11, 1852. Scioto and Alfred were interred in a single crypt at Fort Smith. 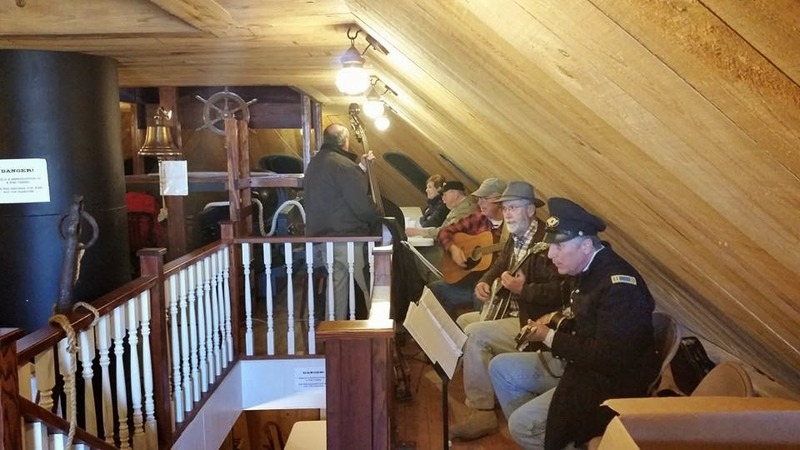 o On February 16, 1854 in St Louis, Gatlin and 3 1/2 year-old son Johnny boarded the steamboat Kate Kearney for a short trip upriver to Alton, Illinois. As the big boat backed out of its slip, a boiler exploded spewing steam and shrapnel. The explosion slightly injured Gatlin but severely scalded Johnny who, after a ten-day hospital stay, died from his burns. o Gatlin's career low point came on March 15, 1862 when, as a Confederate general, he was relieved of command of the North Carolina Department, ostensibly due to "illness", following a Union invasion of the North Carolina coast and their occupation of the town of New Bern in Gatlin's department. The local press excoriated Gatlin, falsely accusing him of drinking and cowardice when an illness prevented him from leading his troops at the Battle of New Bern. The press later recanted and absolved him from blame. o The 48 year-old Gatlin married for the second time in January 1857 to 20-year-old Mary Ann Gibson at Fort Smith. During their 39-year marriage, the couple had seven children of which five died before reaching the age of ten. One-year-old Sallie died in Raleigh in 1864, while in Arkansas infant Robert died in 1866, nine-year-old Richard died in 1869, three-year-old Louis died in 1871, and nine-year-old Bettie died in 1880. Scarlet fever and respiratory diseases appear to have been the cause of all the deaths. Only their oldest daughter Susie (1857-1904) and youngest daughter Mary (1875-1973) lived to adulthood, but neither had children of their own. The youngest child, Mary Knox Gatlin, was born in 1875 when Gatlin was 66 years-old. Mary died in Chapel Hill, NC in 1973 just shy of her 98th birthday. While perhaps not entirely typical, Gatlin's experience with death and tragedy was certainly harsh. The deaths of his children were particularly distressing to Gatlin, but he seems to have taken each experience in stride, and he did not succumb to depression nor immerse himself in strong drink as did so many of his contemporaries. Richard Caswell Gatlin was a Confederate Brigadier General noted for commanding the Confederacy's North Carolina Department from August 19, 1861 to March 15, 1862. Major Gatlin resigned a laudable 29-year army career on the day North Carolina seceded from the Union, May 20, 1861, to serve his home state as a militia general. When the Confederacy took responsibility for North Carolina's military defense in August 1861, Gatlin became a brigadier general in the Provisional Confederate Army and assumed command of the newly formed North Carolina Department. Despite planning a solid strategy and enlisting the aid of Generals J. R. Anderson, D. H. Hill, and Lawrence O'Bryan Branch, Gatlin was unsuccessful in garnering from the Confederate War Department enough resources to ward off a Union invasion and occupation of the North Carolina coast. Union attacks on Hatteras Island in August 1861, Roanoke Island in February 1862, and New Bern in March 1862 resulted in Gatlin's dismissal from command. Eventually, Gatlin was absolved from blame for the Union occupation and he went on to serve as North Carolina's Adjutant General under Governor Vance from August 1863 until the end of the war. Gatlin, a grandson of North Carolina's first governor, Richard Caswell. was born January 18, 1809 at the Red House Plantation in Lenoir County, NC, near the town of Kinston, to John Gatlin and Susannah Caswell Gatlin. After the war, he retired to his wife's family farm in Fort Smith, Arkansas where he had commanded an army post in the 1850s. He died at age 87 in Mount Nebo, AR on September 8, 1896 and is buried at the Fort Smith National Cemetery beside his two wives and two of his children. Gatlin is one of the unheralded Confederate generals and 19th century stories. Besides being the first Lenoir County native to graduate from West Point (1832), he, with the US Army, helped open the American west, and he is the only Confederate general from Kinston and Lenoir County. A privately funded commemorative highway marker erected at the Kinston/ Lenoir County Visitor Center in 2014 and an exhibit of some of Gatlin's possessions, soon to be displayed at the CSS Neuse Civil War Interpretive Center in Kinston, indicate a growing recognition for his place in history. 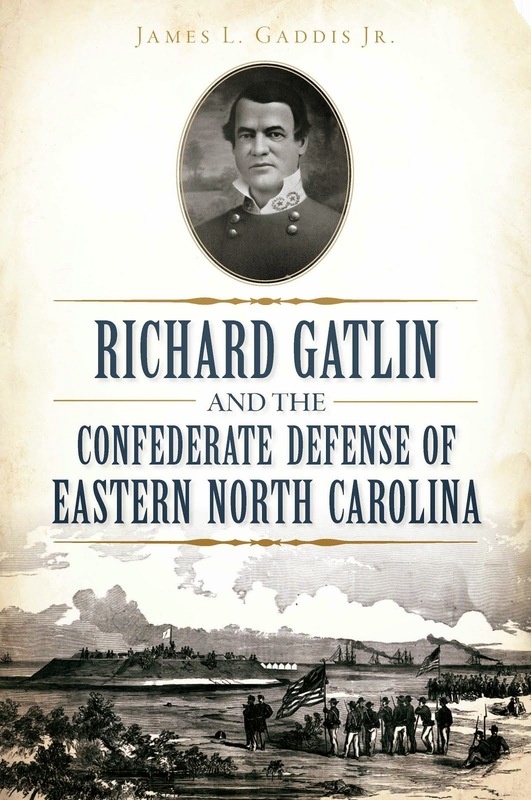 My new book, Richard Gatlin and the Confederate Defense of Eastern North Carolina, is essentially a Gatlin biography covering his early days in Kinston, to his army life in the wilds of America, to his Civil War experience, to his death in Forth Smith. If you read it, I think you will find Gatlin to be quite a likeable fellow and a man for his times. Next time we'll talk about the many tragedies in Gatlin's life. My name is James L. Gaddis, Jr, better known as "Jim" Gaddis. I am a new author, an old musician, and a would-be economist in keeping with my BA in Economics from NC State. This blog will be open to whatever interests me and whatever I feel like discussing at any given time. Initially though, the blog is intended to publicize and promote my first book, Richard Gatlin and the Confederate Defense of Eastern North Carolina, now available for pre-order from amazon.com and barnesandnoble.com. Feel free to visit those sites and check out the book cover and the promo blurbs. Gatlin (1809-1896) was a Kinston, Lenoir County, NC native who was the first from his home county to graduate from West Point (1832). He went on to a distinguished career in the US Army before resigning in 1861 to lend his services to his home state which had seceded in May 1861. I've studied his comings and goings since about 1999, learning bits and pieces about his intriguing trek through the history of the 19th century. The turbulent 19th century carried Gatlin to Indian Territory and Texas during Indian Removal,to upstate New York for the Patriot's War, Florida for the 2nd Seminole War, New Orleans in a brief peacetime, Mexico for the Mexican War, St Louis and Fort Smith for the 1850s, Nebraska and Utah Territory during the so-called Utah War, and finally back to North Carolina as the ill-fated commander of the Confederate Department of North Carolina. Along the way he was blinded in one eye, was wounded in action, buried his parents and siblings, was praised and excoriated by the press, and married twice and lost a wife and seven of his nine children to illnesses. Gatlin's career is historic in its own right, but around here, in Kinston, NC, his biggest claim to fame is being Kinston's own Civil War general. I'll be telling you more about Gatlin as time goes by, but you will get to know him fairly well by reading my book. I am also intensely interested in the US monetary system which I believe is one of the least understood, or most misunderstood, topics of our times. I have come to believe that federal taxes destroy money and do not fund federal spending, that the federal "debt" is better viewed as private sector "savings", and that federal deficit spending is responsible for any and all aggregate private sector net savings and financial assets. You can file those ideas under the headings of Monetary Soverignty and Modern Monetary Theory. So join me if you will. Let's talk about Gatlin, Civil War, monetary and fiscal workings and policy, and, oh yes, Ian Tyson music. 81 year-old Ian will be flying east for a one-time concert up in Alexandria, Virginia in May and I already have my tickets.